CJ Todd 9 months, 2 weeks ago. WELCOME TO THE CAMPING GEAR FOR RENT/SALE FORUM! The purpose of this thread is to describe what the StokeShare Camping Gear For Rent/Sale Forum is and how to use it to buy/sell/rent camping gear. 1. What is the Camping Gear For Rent/Sale Forum? 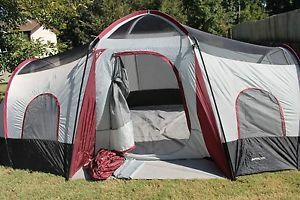 I have a Wenzel 10 Person Camping tent for sale in Los Angeles. It’s only been used twice and is in excellent condition. All of the stock accessories are accounted for and none of the zippers are broken. Asking $80 ($110 brand new) but will consider best offer. PM me for more info, thanks! * Use the search bar to look for the gear you need. * If you can’t find it, post a question asking the forum for the gear you need. Does anyone have a 10-Person Tent I can borrow or rent for the weekend in Los Angeles? PLEASE REMEMBER… KEEP THE FORUM FRIENDLY! Be aware of StokeShare’s forum-posting guidelines, which all members must follow when using the forums. Self-promotion and spamming will result in the immediate removal of posts by StokeShare Admin. If you have a rad skiing blog that you think others will enjoy and you “just happen” to be the author, we’ll let it slide. Personal attacks on fellow StokeShare members will not be tolerated and can result in posts being removed as well as the removal of your StokeShare accounts. Stick to those simple rules and help keep this a fun and friendly forum. We’re here to share the stoke!! William good stuff! I need to get one of those solar backpacks!